This is the day when the top kill of the leaking BP well in the GOM will likely be attempted. Kent Wells, Senior Executive VP for Exploration and Production, has given a technical brief on what is likely to happen. Having tried a number of other ways of describing the underlying idea, a more mundane example came to mind. If you have roots growing into the drain that runs out of your house, and you turn the tap on in a bathroom, the water will still be able to get down past the roots, and there is no problem. However if you flush a toilet or equivalent higher flow, this can’t easily get past the roots, and thus the water backs up and flows back out into your basement. One thing that should be noted, however, is that most illustrations show a section of the BOP such as the one just below (which I modified from one in the WP) . Life is actually more complex since there are large rams sitting in the side ports that appear as notches on the main flow line. The actual position of the rams and the condition of the pipe that runs through the assembly somewhat in question (through BP used gamma rays to check it out), and this flow channel complexity may play a little part in the response to the Top Kill injection. Hopefully it will tend to act as "roots" and make it more difficult for the flow to reach the riser, and then leak onto the seabed, and more likely for the flow to be directed down the well. In his presentation Kent Wells noted that there is not just flow from the Q4000 available, but that additional vessels, including the HOS Centerline are connected into the Q4000 and available to add additional flows and volumes of mud if needed. This can carry up to 30,000 barrels of mud, and deliver this to the Q4000 at a flow rate of 50 bbl/min. It is supported by a second vessel, the M/V Blue Dolphin, which carries 11,800 bbl of mud, that can deliver it at a rate of 80 bpm, using 9 pumps. If needed this has more than enough capacity and flow for the job required. fracturing units can store 2.75 million lb of proppant. The vessel can provide up to 23,000 hydraulic horsepower and 80 bbl/min blending rates to meet high-rate fracturing and stimulation requirements of ultra-deepwater projects. At more than 300 ft (91 m) in length, the multipurpose vessel includes additional storage for up to 11,800 bbl of fluids or completion brines, 12,600 gal of raw acid and 6,300 gal of solvent. The Blue Dolphin has a maximum on-the-fly acid blending capacity of 50 bbl/min. “The advanced capabilities of the Blue Dolphin vessel have made it the flagship of BJ Services’ stimulation fleet,” said Ronney Coleman, vice president for North America pressure pumping services, BJ Services. It is the first 20,000-psi pressure-rated stimulation vessel specially designed for Lower Tertiary conditions, which include long, multiple-pay zones and intense pressure and temperature variations. With such capabilities there is more than enough pressure and volume to overcome what pressures and flow rates are found in the well. At the moment the rig is undergoing final diagnostic tests to ensure that the valves, fittings, hoses pumps etc are all operational and that there are no leaks. (At these pressures – perhaps 10,000 psi or so – the drilling mud can cut into metals, so that a leak can very rapidly grow to unacceptable size). “What we learn during the diagnostic phase will be absolutely crucial to us,” Wells said. The top kill procedure, which may begin as early as tomorrow, might take as little as 12 hours or as much as a “couple of days” to carry out, Wells said. 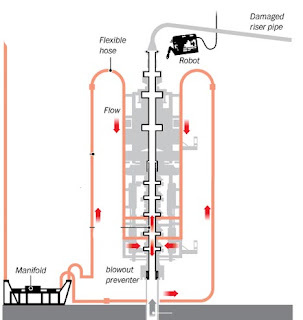 The operation may, if seen to be needed, include a variation of the “junk shot” since there are rubber strips on hand, that could be added to the mud flow and which would, if caught in the BOP, restrict further the flow path out of the riser, and make it easier to get the mud down the well. (Like adding additional roots to your drain to make it back up faster). Over the next few hours, engineers will test the pressure at each opening, aiming to design a pumping procedure that will “outrun” the flow of oil and gas, forcing it back down into the petroleum reservoir. Should pressure from the well outrun the drilling fluids, engineers may inject heavy fluid mixed with rubber scraps through valves above the mud flow to hold it in the well, Wells said. Even if the mud starts down the well as planned, there may be complexities in the flow, based on where the oil appears to be coming from. Flow from the Macondo well is not travelling up the main well bore, BP operations boss Doug Suttles said Tuesday, a revelation that would support theories that a cement failure played a part in the blowout. “We actually believe the flow path is between two strings of the casing and not up the main wellbore,” Suttles said. Suttles said BP could not be certain of the flow path but diagnostic tests on the well seem to indicate the flow is not coming up main bore. As the complexity of the job becomes evident there are also reports that the Government are stepping back from taking over the problem, should this try fail. After days of lambasting the company's handling of the spill, the Obama administration appeared to step back from Interior Secretary Ken Salazar's threat on Sunday to "push out" BP if it did not do enough to plug the leak. The U.S. government needs BP's deepwater technology to try to shut off the oil well, said Carol Browner, President Barack Obama's adviser on energy and climate change. "Obviously, we need the BP technology, but we are not relying on them ... we have our own minds in there," she told CNN, referring to the team of government scientists working with BP to battle the disaster. Some longer term punishment is, however, apparently now being considered. ProPublica is reporting that that the Environmental Protection Agency is considering whether to bar BP from receiving U.S. government contracts, a move it said would cost the company billions of dollars in revenues and could end its drilling in federally controlled oil fields. A memo released by Democrats on the House energy committee said that BP has found three “flow indicators” from the well before the explosion, one of which occurred 51 minutes before the blast, a time when more fluid began to flow out of the well than was being pumped in. When the pump was shut down, 41 minutes before the explosion, the well continued to flow instead of stopping, and drill pipe pressure “unexpectedly increased”. Then, just 18 minutes before the explosion, abnormal pressures were observed by the rig crew. Eleven men died as a result of the explosion. It should be noted, since there were comments on both PBS and ABC News tonight about the change in the oil color coming out of the riser in the last two days, that the clear difference in the photos they showed was the lack of the injected dispersant in the later pictures, and BP have stated that they have cut back on the volume of this, under EPA orders. Since it was mixing with the oil and changing its color, this may be part of the change that folk have been noticing. And, after some debate today, BP has announced that they will continue the live feed from the seabed during the time that the top kill is initiated. Carol Browner is an idiot who couldn't fix a leaking sink, much less a leaking deepsea oil well. The US government cannot be taken seriously when it threatens to "take over" the well capping activities. That is same type of delusion of omnipotence that made some people believe the US government could bring American democracy to primitive tribal people in the middle east. As incompetent as Browner is, I would more likely hire her to fix a leaking faucet than her boss Obama.